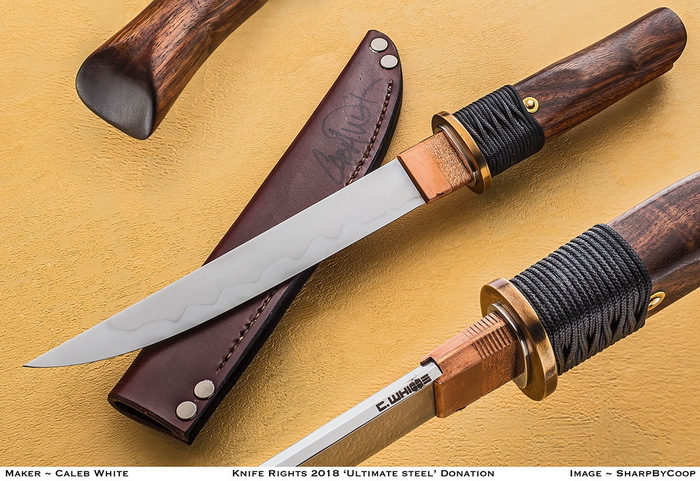 **** Chosen by Winner: Robert G.
Caleb White's striking Hira-Zukuri Tanto fixed blade has an 8.5-inch blade of W2 high carbon tool steel with a distinct hamon and copper habaki The carved handle is Chechen wood with a steel guard. My interest in knives and swords started very young while growing up in west Texas. My great-grandfather would take me to the shop behind his modest home and let me look at the various tools and knives he had created over the years. My favorite was a wavy bladed dagger he made from an old file circa 1920. Those memories are the earliest I have of a burgeoning desire to build my own blades. My passion for blades was further inspired by my time in the Indian Guides as a boy: I remember very fondly the first Swiss Army knife I received as a gift; in those days boys could still carry a pocket knife at school, and the knife rarely left my reach. I began developing a deep love for all types of knives, swords and armor; I also found great inspiration in books and movies about Samurai and Medieval knights. One of the biggest inspirations for me artistically has always been my dad, Tom White, an amazing sculptor, artist, craftsman, and father. His support has always driven me to learn to new crafts and not be afraid to take risks. I joined the US Air Force in 1998 at the age of 18 and spent ten years traveling around the world and on various deployments. My time in the desert and other countries gave me an even deeper appreciation of a well-made knife and I began to pursue the art. Later in my career I met my mentor Brett Bennett while stationed in Wyoming. Brett was an established knife maker and offered to show me the basics. I quickly became consumed with the craft and knew I would do it the rest of my life. At the time I had no shop of my own so I spent hundreds of hours drawing knife designs and acquiring tools. I still have drawers full of knife patterns and believe that all those hours drawing have given me a very deep understanding of how to design an effective blade. Since those first days in Brett’s shop I’ve been honorably discharged from the military, moved across country, gotten married, had two kids, and earned a Bachelors Degree in Graphic Design. Knifemaking has been a constant passion and driving force in a lot of my decisions, but was relegated to weekend and nighttime grind sessions. I am currently pursuing my dream of doing it full time. Over the last eight years I have spent thousands of hours in front of a grinder, and countless dollars on steel perfecting my craft. The journey hasn’t been an easy one, but remains one of the most gratifying things I’ve ever done.